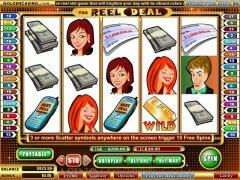 The Reel Deal is a video slot from Vegas Technology. It has 5 reels, 20 paylines and a maximum bet of 20 coins. 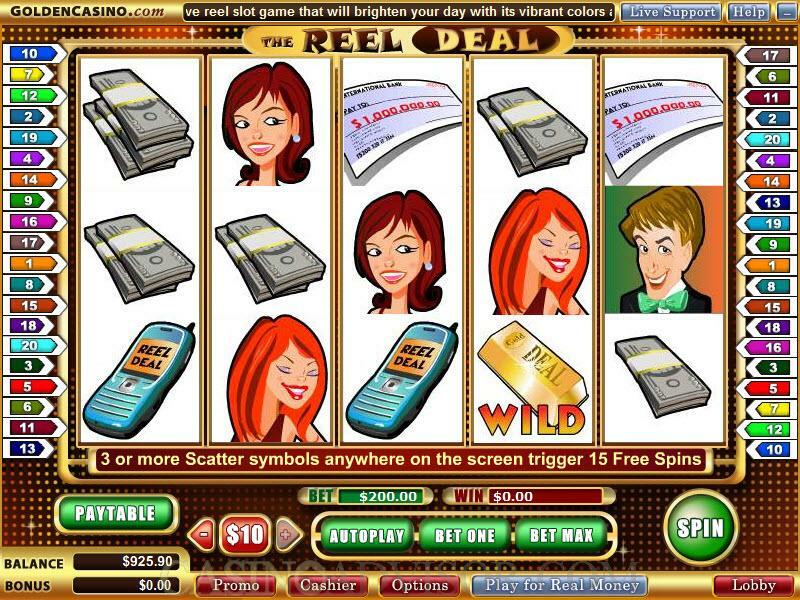 The slot is based on the popular television game show Deal Or No Deal, which has been played in several countries across the world. 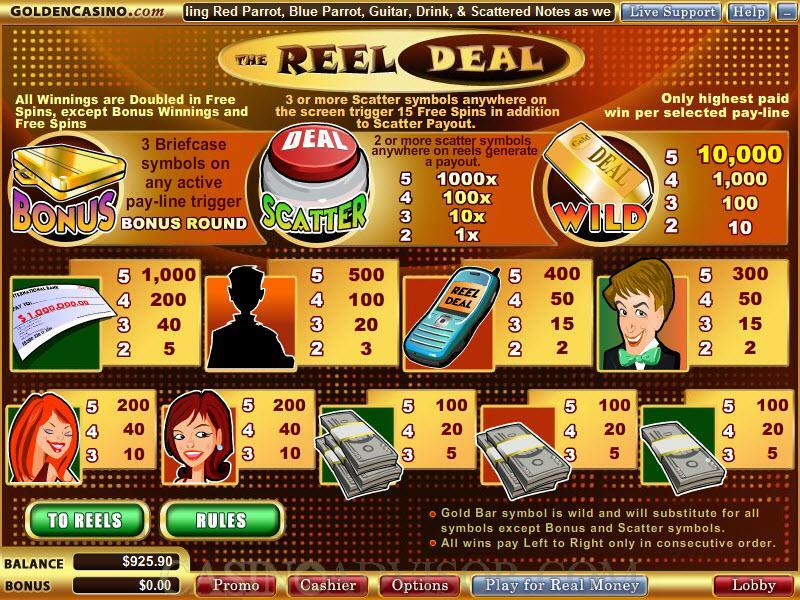 The online slot creates the ambience of the game show by representing its facets as symbols on the reels. The Gold Bar is the wild symbol. The Deal Button is the scatter symbol and the Briefcase is the bonus symbol. The Deal Button triggers the free spins bonus round and the Briefcase triggers the bonus game on the second screen. The other symbols on the reels are the Check, the Banker, the Phone, the Host, the Hostesses and the Cash Bundles. Before starting the game players will have to choose the coin denomination by operating the +/- signs on either side of the coin denomination button. Coin denominations are 0.01, 0.05, 0.10, 0.25, 0.50, 1.00, 5.00 and 10.00. Players will also have to enable up to twenty paylines by clicking on the BET ONE button the appropriate number of times. All twenty paylines can be activated by clicking on the BET MAX button. Winning combinations pay only if they occur in enabled paylines. 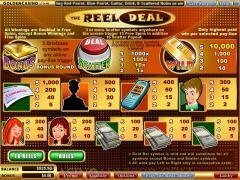 In The Reel Deal players can wager only one coin per payline by default. But this is hardly a problem because the coin denomination range is suitably larger. Once the settings have been completed the game can be started by clicking the SPIN button. The Gold Bar Cleopatra is the wild symbol. It does not multiply payouts but it offers a fixed jackpot of 10000 coins when five symbols appear in an enabled payline. The Deal Button is the scatter symbol. Two or more scatter symbols result in scatter payouts. Five scatter symbols have a payout of 1000 coins. The free spins feature is triggered when 3 or more scatter symbols appear anywhere on the reels. 15 free spins are offered at doubled payouts. Additional free spins can be triggered during the free spins round but these additional free spins are at normal payout. Three Briefcase symbols appearing in any enabled payline trigger the bonus game on the second screen. This game replicates the Deal Or No Deal game to perfection. The player first selects his briefcase and then starts eliminating from the others as instructed. Depending on the values contained in the briefcases left the banker offers the player a deal from time to time, which the player can accept or reject. If he rejects all the deals then he has to choose from his briefcase and the last left briefcase. Interested in reading more detailed information about The Reel Deal? If so Click Here for more details.